Every week we check the calendar of International Conferences in order to provide you with a list of the most relevant and interesting events focused on terminology, translation and linguistics. Our weekly proposal mainly contains European conferences, without excluding the major international conferences worldwide. 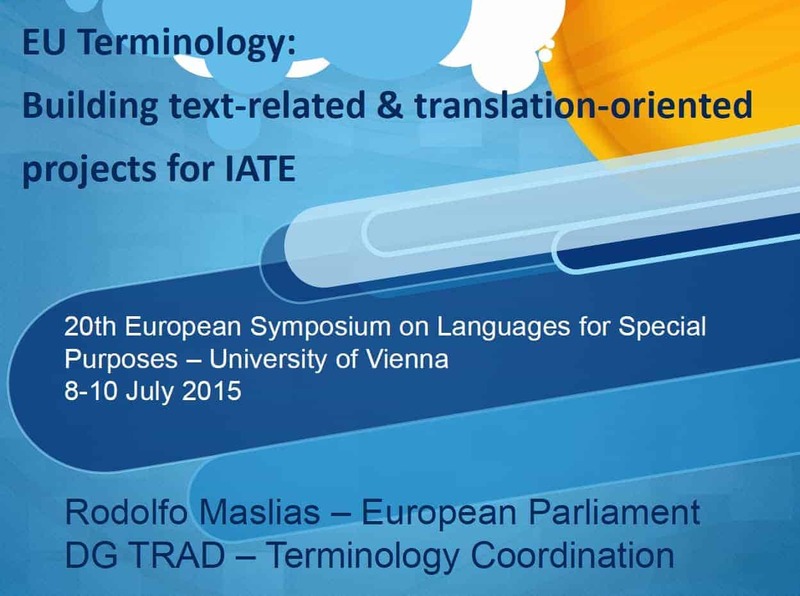 One of the most important events for this week will take place on Wednesday 8th July in Vienna, where Rodolfo Maslias, Head of the Terminology Coordination Unit of the European Parliament in Luxembourg, will make a presentation including some interesring topics such as Terminology projects of EP-TermCoord and universities, proactive terminology work at the EP and terminology workflow with the help of CAT tools. Here is the link to the conference: 20th European Symposium on Languages for Special Purposes (LSP): “Multilingualism in Specialized Communication: Challenges and Opportunities in the Digital Age”; Vienna (Austria), 8-10 July 2015. Stay tuned on termcoord.eu to access the full presentation in the next days.